Anna Bergren Miller: When mortgage activist Ada Colau prevailed in Barcelona’s May 2015 mayoral elections, she made headlines worldwide as a double first. 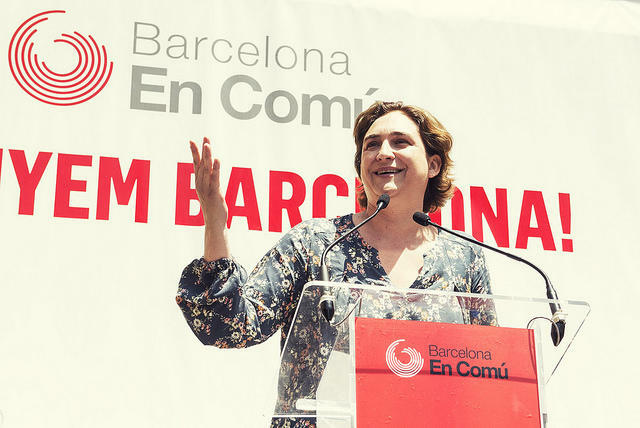 The first woman to achieve the city’s highest office, Colau had, moreover, entered the race not as a representative of one of several entrenched political parties, but as a spokeswoman for Barcelona en Comú (Barcelona in Common), a citizens’ platform dedicated to democratizing the city’s political, economic, and social structures. In the wake of Colau’s victory, grassroots activists around the world wondered: How did they do it? How did Barcelona en Comú’s diverse supporters overcome the external and internal obstacles to bottom-up political revolution? To answer these questions, the International Committee of Barcelona en Comú earlier this year published How to Win Back the City en Comú: Guide to Building a Citizen Municipal Platform, a brief but specific summary of the Catalan group’s electoral strategy. One of the most important points the pamphlet addresses has to do with Barcelona en Comú’s decision to engage in municipal electoral politics in the first place—a focus that other activists might criticize as overly narrow. Barcelona en Comú’s entry into the 2015 mayoral race was not a symptom of a lack of imagination. Rather, it was a strategic choice, a pragmatic first step to a total transformation of the city’s political, economic, and social institutions. “The proximity of municipal governments to the people makes them the best opportunity we have to take the change from the streets to the institutions,” explain the guide’s authors. As for the nuts and bolts of grassroots electoral politics, How to Win Back the City en Comú has plenty to offer would-be revolutionaries in other cities. A citizens’ platform, the guide’s authors insist, will not be successful if it is not specific to the municipality’s politico-economic context and expressive of genuine bottom-up sentiment. It should strive for gender parity: “A revolution that isn’t feminist isn’t worthy of the name.” Perhaps most importantly, a citizens’ platform is not a political party, nor is it a vehicle for a particular party’s views—nor even a coalition of parties as traditionally understood. Creating a citizens’ platform involves cooperation, not competition, a reframing of politics around shared priorities rather than party allegiance. How to Win Back the City en Comú outlines both the organizational structure of Barcelona en Comú and the chronology of its 2014-15 campaign. Importantly, the former involved a combination of public forums (both in-person and online), specialist committees, and individual spokespeople (of whom Colau was one). The latter utilized crowdsourcing technology to distill widespread discontent with the political and economic status quo to a set of concrete commitments Colau adopted upon taking office. As Barcelona en Comú acknowledges, the details of “En Comú” electoral campaigns elsewhere will necessarily differ according to on-the-ground conditions. But what better place to start than with a successful example of political revolution from below?